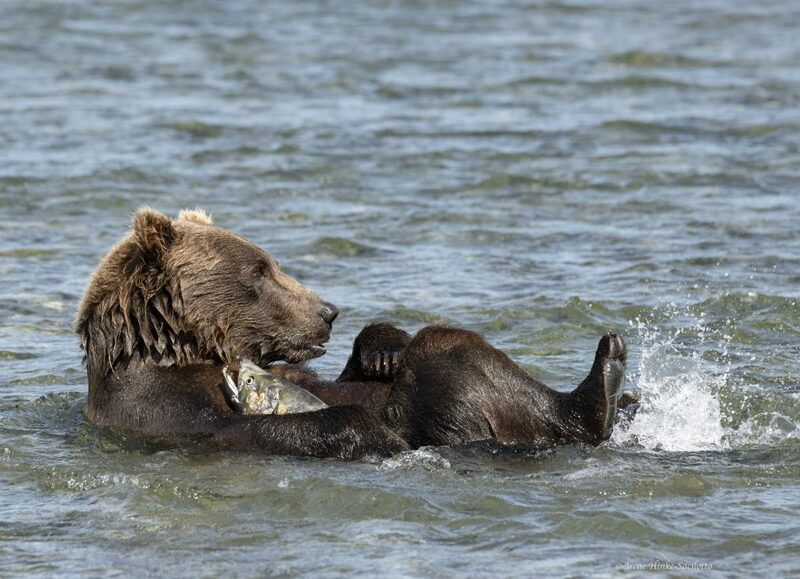 Brown bear clutching fish it just caught. McNeil River State Game Sanctuary. I just returned from McNeil River State Game Sanctuary in Alaska, a location 100 miles from the nearest road system and the town of Homer. It is reachable primarily by float plane when tides are favorable for a safe landing. The area is one of the most remarkable places I have ever visited, with the world’s largest concentration of wild brown bears. 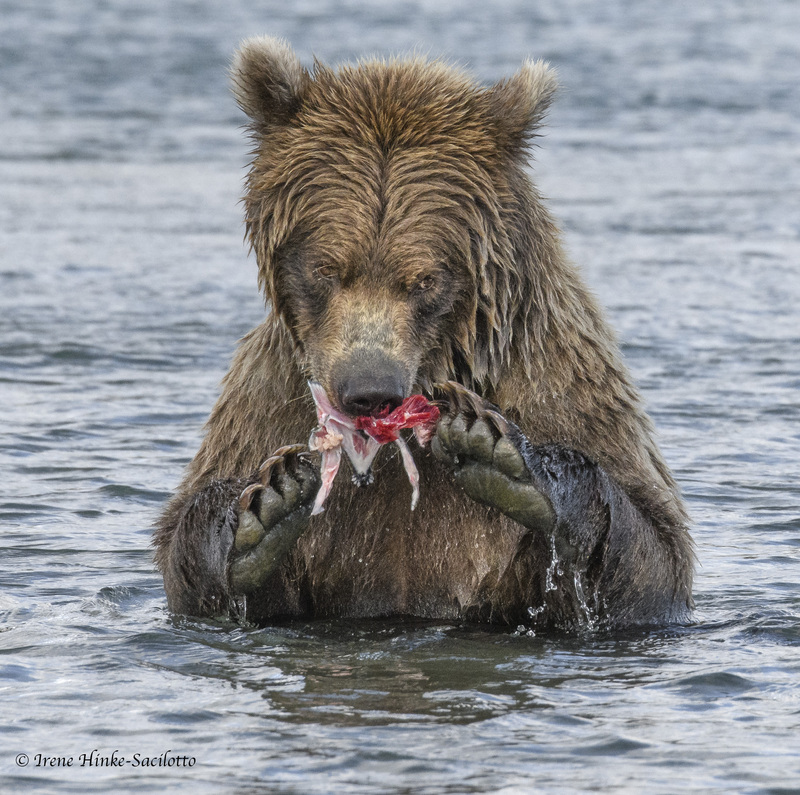 Seasonally, after winter hibernation in the high country, the hungry bears gradually gather at McNeil River and Mikfik Creek on the sanctuary to feast on the salmon that spawn there each year. Here the bears are protected and there is no hunting. The permits for “guided viewings” of the bears at McNeil River State Game Sanctuary are granted through a state-run lottery system. The number of visitors is limited to 10 at a time, for a period of 3 or 4 days. I had entered the lottery before but lost. But this year a friend and I were finally lucky enough to be selected for 4 days of guided viewing of the bears in the month of August. From Homer, we flew to McNeil on a float plane which landed in the estuary where the Kamishak Bay meets the mouth of the McNeil River. The location is more beautiful than I had imaged with spectacular views of the distant 3000 to 5000-foot snow-capped mountains of the Aleutian Range. At their base and approaching the coast were rolling hills that met the sea in a series of bluffs, cliffs, lagoons, mud and sedge flats, rocks, and pebbled beaches. 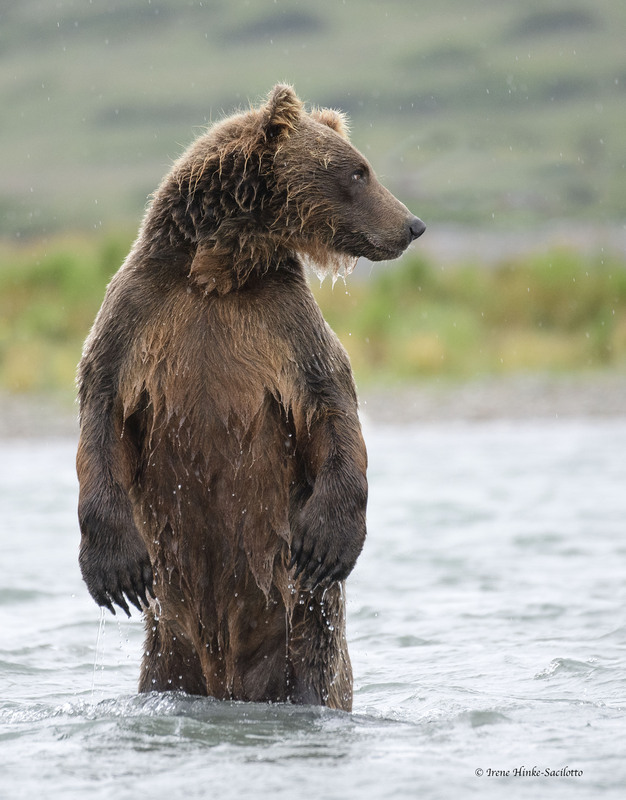 Each day, from approximately 10 a.m. to 8 p.m., we spent time in the field with a guide and hiked 4 to 5 miles a day to various locations for bear viewing and photography. One day, from a sand bank along the lower falls, our guide spotted 19 to 22 bears at one time, some close and others farther away and only visible with binoculars. Each seemed to have its own fishing technique—submarine style swimming under water to pouncing on a fish with its paws. Unbelievable! As for all visitors, we stayed in a primitive campground with limited facilities designed to minimize disturbance to the environment. 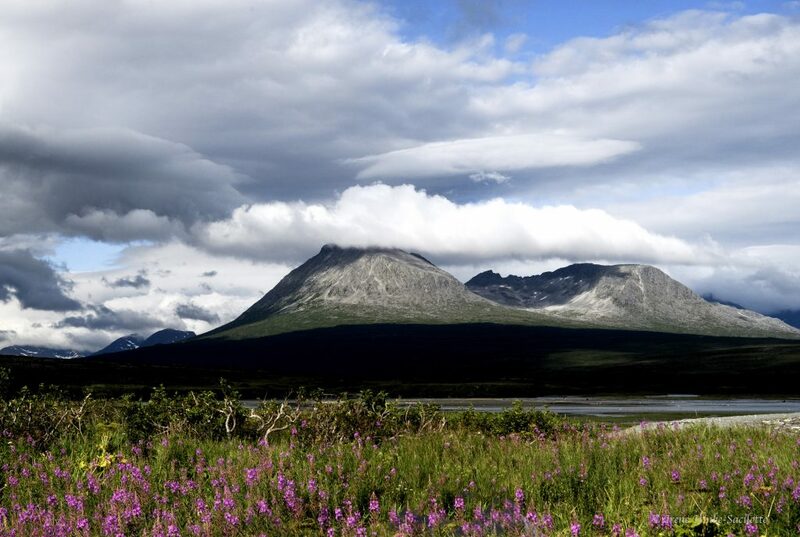 It was adjacent to a pebble strewn beach and was partially surrounded by stands of alders and fields of fireweed. We were required to bring in our own camping gear, food, and supplies. We pitched our tents on designated circular gravel beds which were somewhat sheltered from the wind. In terms of permanent structures in the compound, there was a cook house, sauna/wash house, and 2 pit toilets, a tool shed, plus several cabins for the staff. Immediately upon first arriving at the camp, all food and items with odors that might attract bears had to be stored in the cook house. 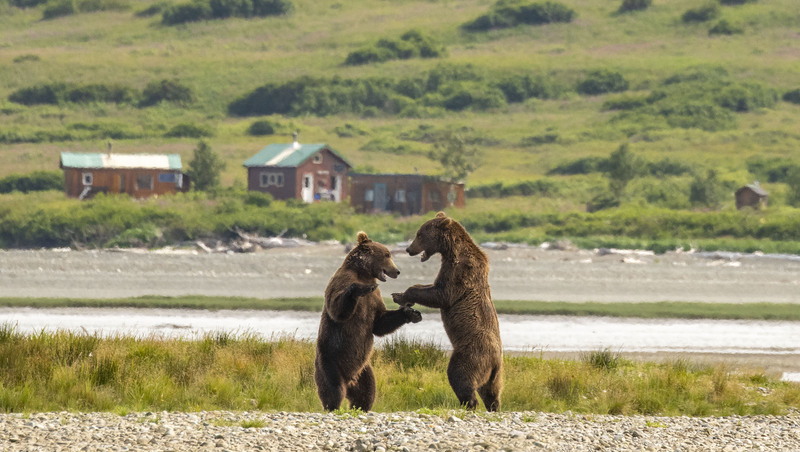 This precaution was to minimize the chance of bears entering the camp and associating humans with food, which could influence bear behavior, creating a problem bear. In the cook house we prepared meals, socialized, and received briefing for each day’s outing. Pots and pans and several burners were provided for cooking. A wood stove offered warmth on chilly days and gave us a way to dry socks, towels and other clothing. We were very lucky that during our stay the weather was moderate, approximately 60 during day and 50s at night. It only rained steadily part of one day. On the other days, there was a mix of sun and clouds. Bear carrying fish after catching it. 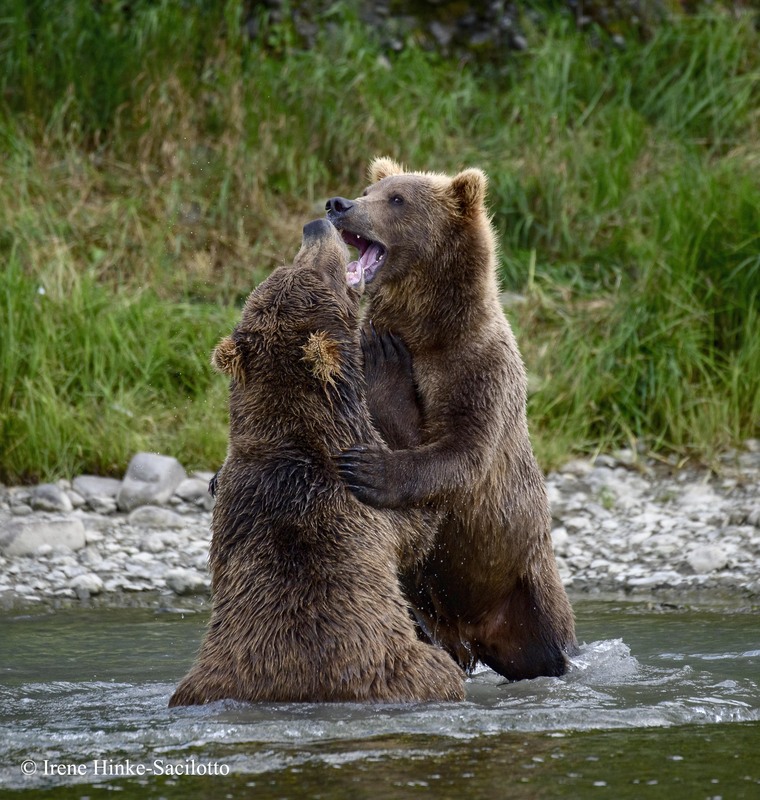 In August at the McNeil River State Game Sanctuary, most bear activity was confined to the lower falls with a little action at the upper falls due to a reduced number of salmon at this time. Each day we followed primitive, sometimes muddy uneven trails through sedge and mud flats, across slippery pebble-strewn beaches, up hillsides, through steams, and across a tidal lagoon. Waders were definitely required and crossing the lagoon could only be done when the tide was low. 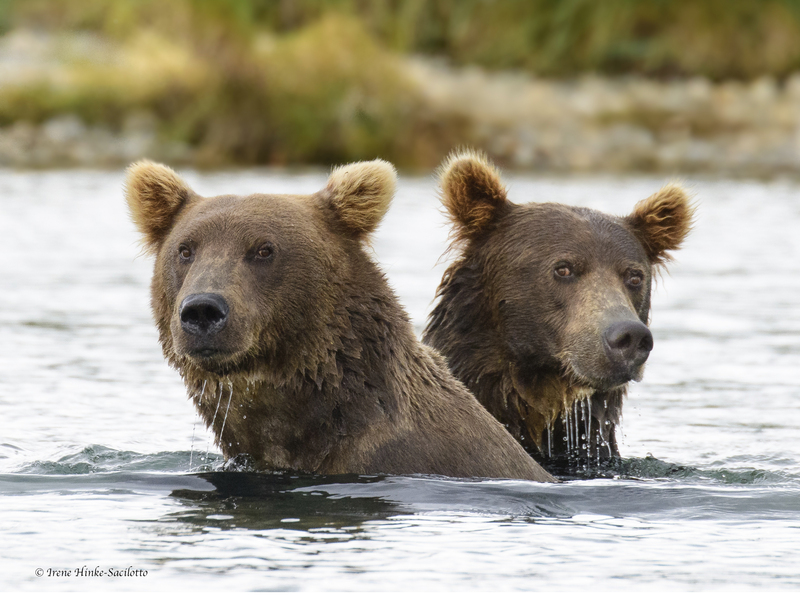 Each day we left camp at approximately 10 a.m. and arrived back in camp at 8 p.m. We hiked with our photo gear several miles to visit beaches and areas where we could safely observe and photograph the bears feeding on salmon and interacting. On two days, we visited the upper falls where there was a viewing platform and camp chairs were provided for comfort. The view was super but few bears were present. 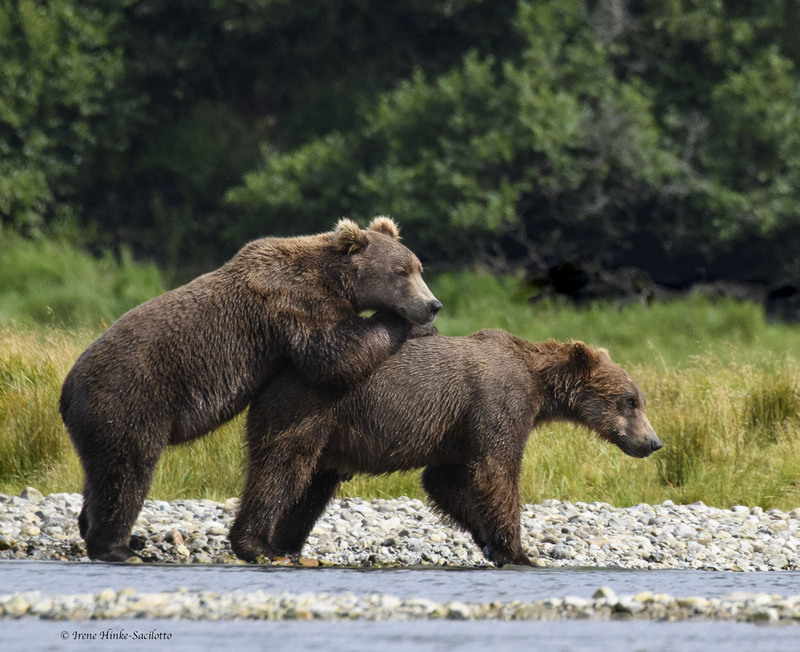 (In June, most bear activity is at Mitfik Creek and in July it is at the upper falls where up to 80 bears may congregate. We followed the protocols established for visitors. We were required to be in the presence of a guide except at camp. In the field, the bears paid little attention to our presence and we felt relatively safe. 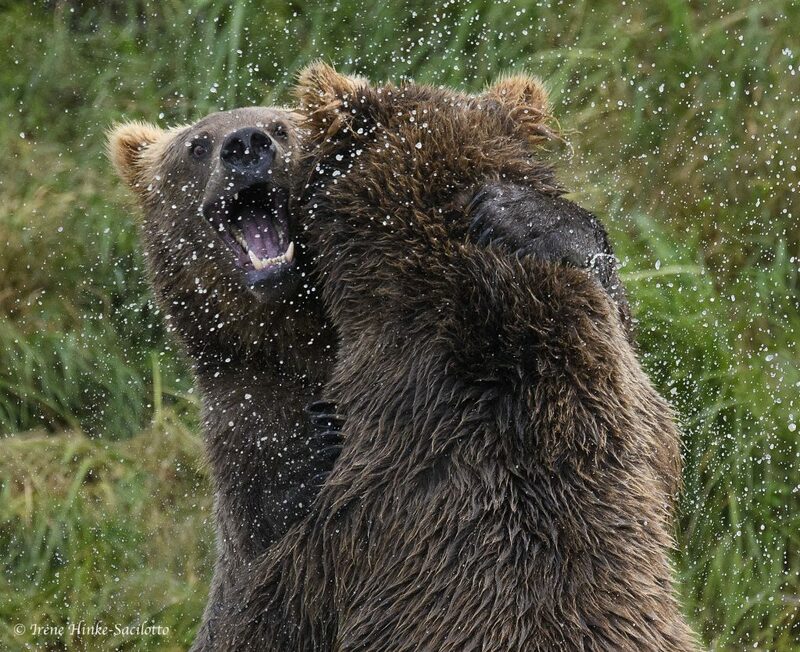 These rules of human behavior around bears was developed primarily by a remarkable man, Larry Aumiller, who for over more than 30 years has studied the bears of McNieil. He concluded that human safety was more dependent on managing human behavior than managing the bears. For the last 40 years, no humans have been harmed nor has it been necessary to shoot any bears. Trail to viewing point at McNeil River. 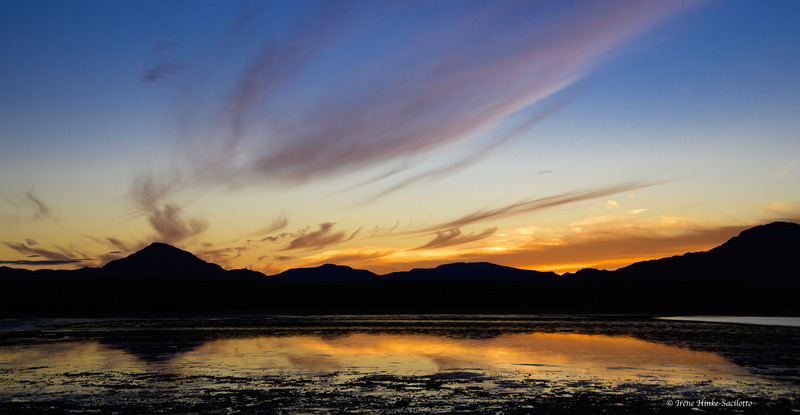 Sunset at McNeil River Camp. Overlooking lagoon. Staff & guests going to fill containers with water that will then be filter by guests for drinking. 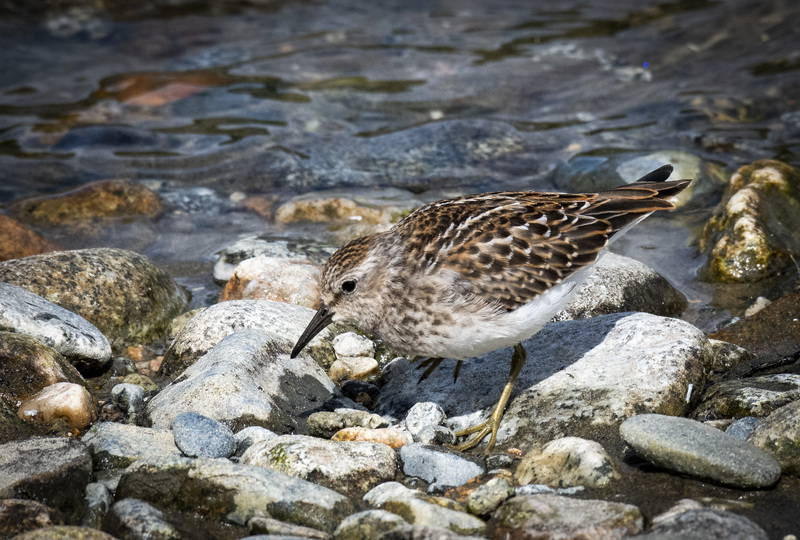 Least Sandpiper along McNeil River. One of the bird species that visit the sanctuary. 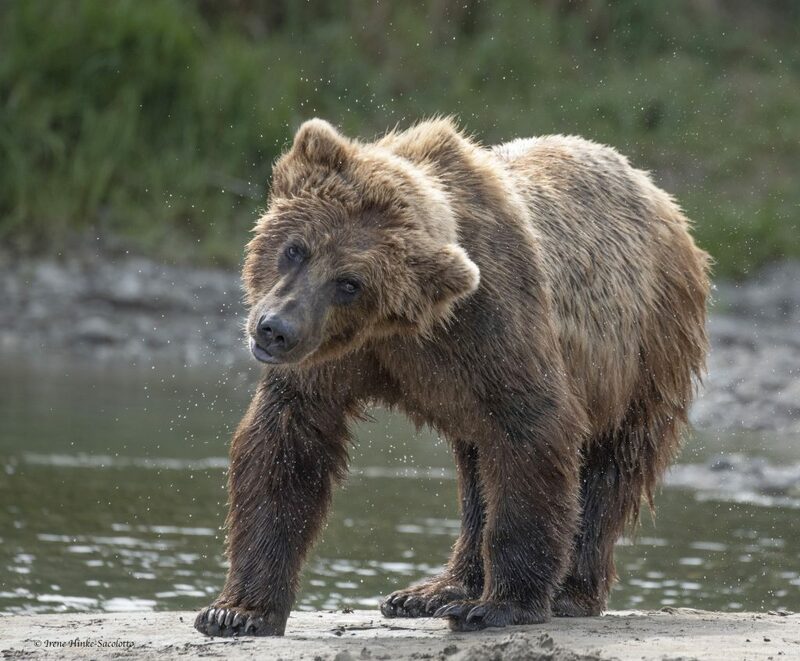 The guides at McNeil River State Game Sanctuary were very knowledgeable about bear behavior and made it clear that our activities would not alter the animal’s activity. 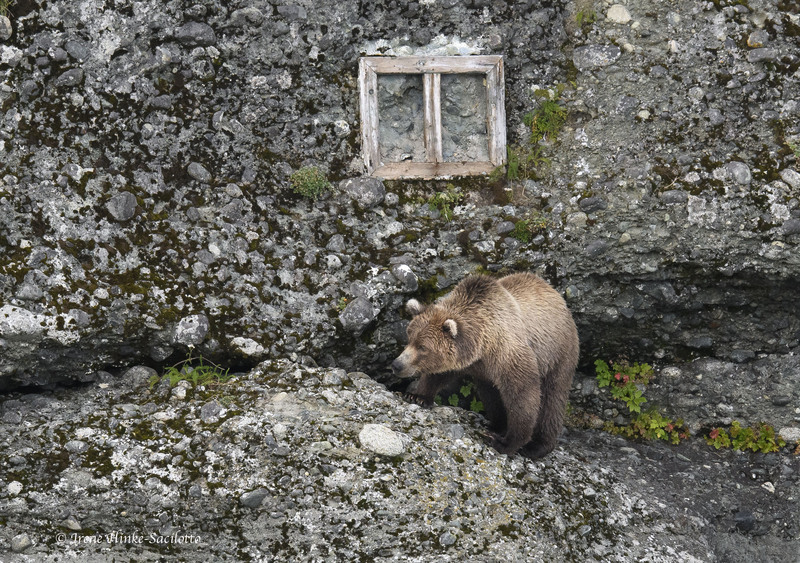 Part of the safety protocol was that neither guides or visitors were to surprise the bears. Hunan movement was to be consistent and nonaggressive, so the bears perceived humans as no threat. Group sizes were limited to no more than 10. Times of excursions and routes taken were roughly the same each day. As we hiked and whenever we stopped to photograph, we were required to stay in a tight group with no one making sudden movements, sounds, or bounding away from the group for a better photo. When leaving a location, we were reminded to be sure to leave nothing behind, particularly food scraps. 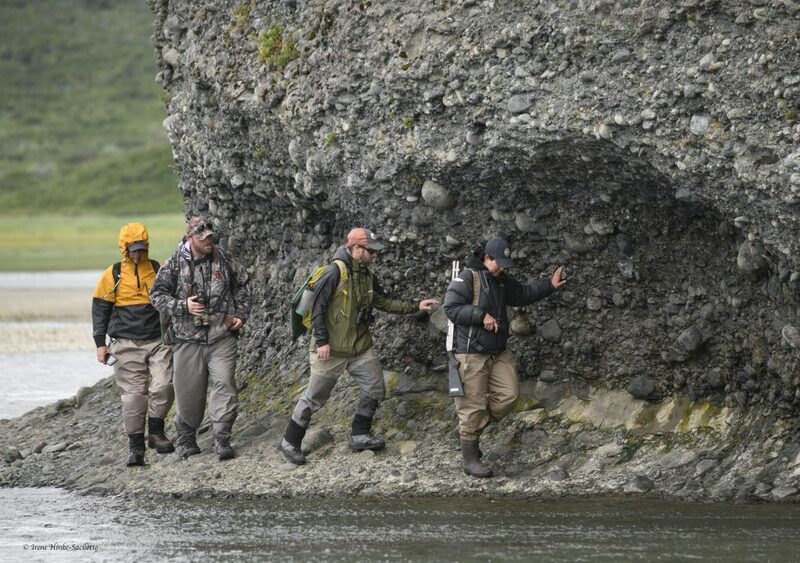 The bears were allowed to decide their path and how close to approach. When we rounded blind corners or entered areas of heavy vegetation, the guide would repeat in a low voice phrases such as “hey bear”. If a bear seemed to be overly focused on us and could possibly be a threat, the guide used the least contentious aversion technique to dissuade it, such as clicking two stones together. This was never necessary. On several occasions, a bear passed by within 12 feet from the nearest member of our group and just slowly sauntered by. In the unlikely event of an attack, the guides do carry a 12-guage shotgun slung over their shoulder or lashed to side of their pack. 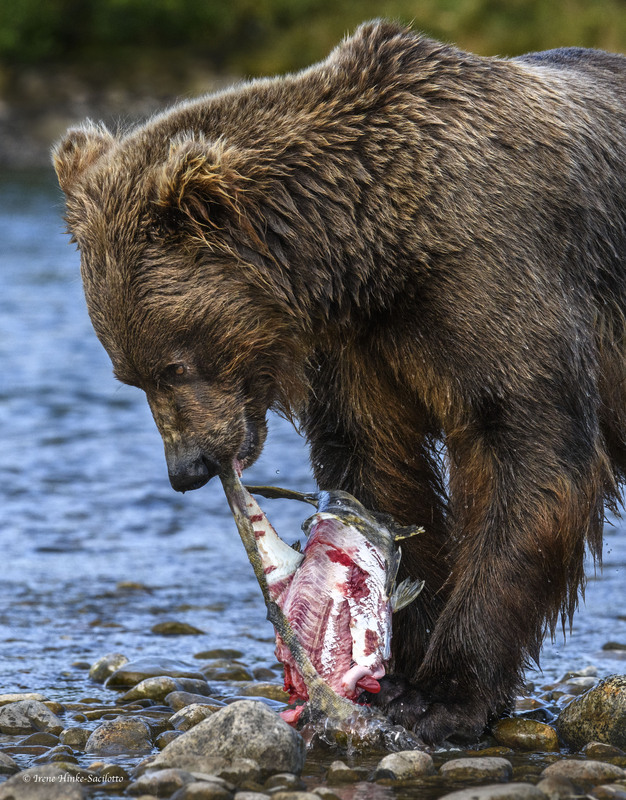 Bear skinning salmon before eating it. Red fox at sunset that hung out near the camp ground. 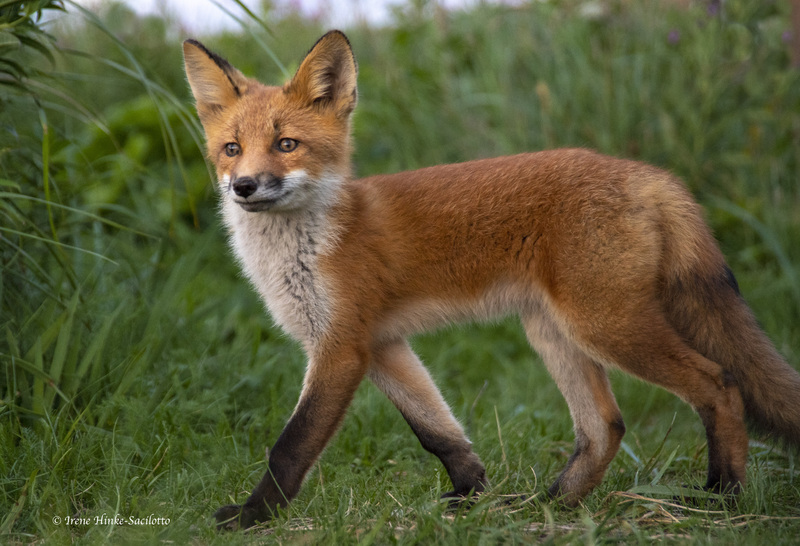 A red fox and her kits sometimes appeared at the camp in the evening. During our forays into the field, we often saw bald eagles perching on snags and cruising overhead. We were told ground squirrels and wolves were around but we did not see either. Picking up scraps of food left by the bears were Glaucous-winged and Mew Gulls. 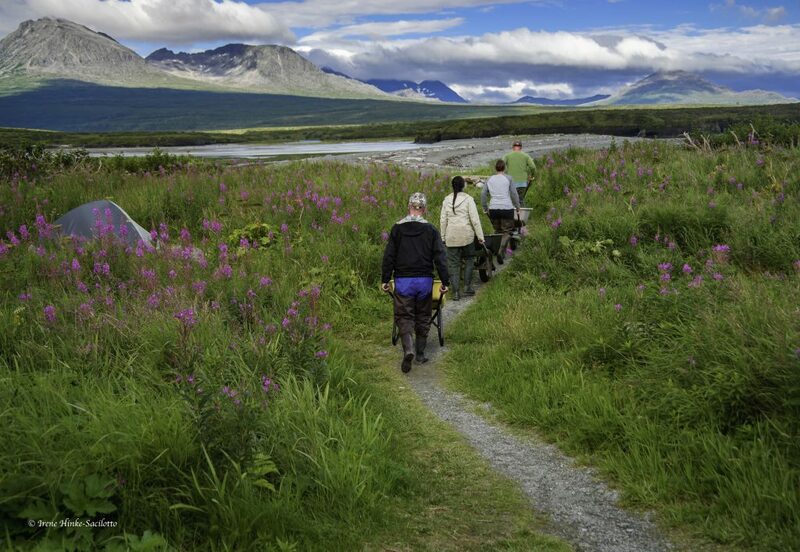 As we hiked at various elevations, besides fields of fireweed and sedges, we saw pea, Senecio, arctic daisy, Siberian asters, wild geraniums, cow parsnip, low growing willow, crowberry, bunch berry, mules tail, and low bush blueberry. 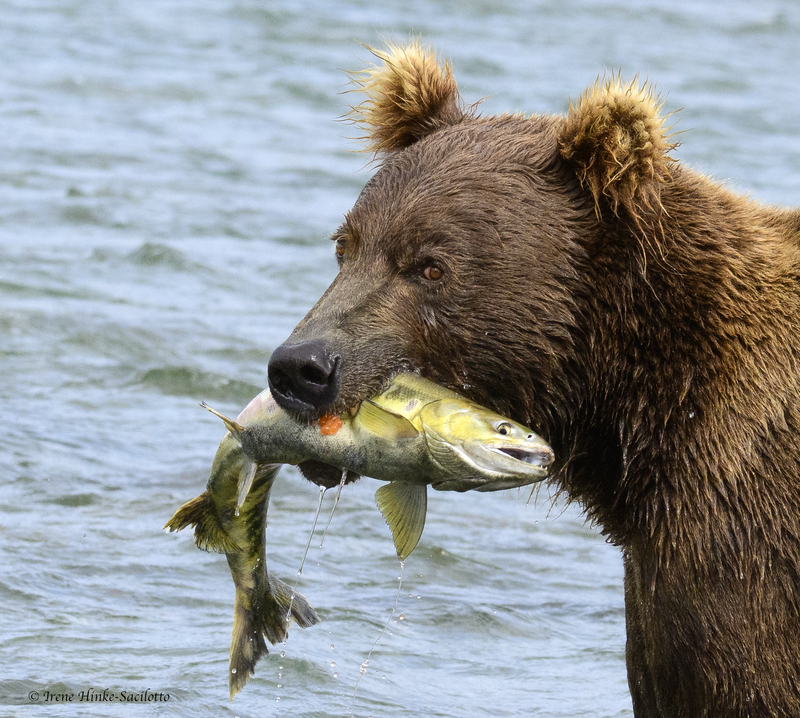 When the supply of salmon at the end of the season runs low, the bears would feed on the sedges and berries, adding variety to their diet. Sibling bears in McNeil River. 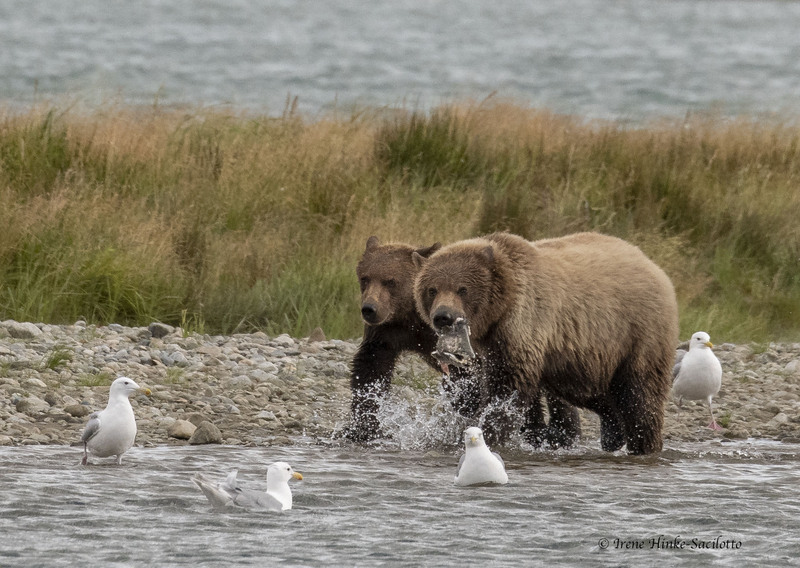 Adult bear with fish and with cub and Glaucous-Winged Gulls to pick up scraps. Bear walking along rock wall along side McNeil River. For me, the time spent on McNeil Sanctuary was one of the highlights of my life. 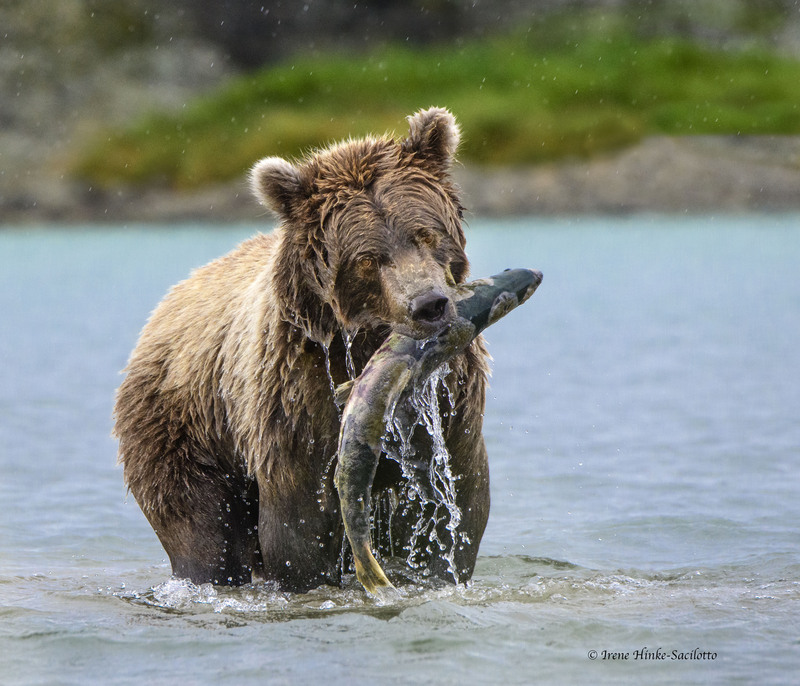 You can read more about the sanctuary in two books: “River of Bears”, with text by Tom Walker and photos by Larry Aumiller and a book about Larry Aumiller’s thirty years among the bears, “In Wild Trust”. Brown Bear eating salmon at lower McNeil River Falls.